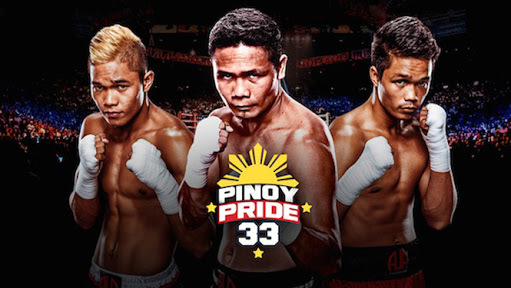 Check out the Pinoy Pride 33 results. Happened at StubHub Center Carson California today October 18, 2015 (PHT). First Fight: Bruno Escalante wins via UD against Nestor Ramos of Mexico. 2nd fight: Mark Magsayo wins via 1st Round TKO against Yardley Suarez of Mexico. Suarez down twice in round 1. 3rd fight: Jason Pagara dominates after beating Santos Benavidez via 2nd round TKO. Benavidez down twice in round 2. 4th Fight: Albert Pagara defeats William Gonzalez of Nicaragua via 6th round TKO. Pagara scores a knockdown in round two and finish it in round 6. Pagara got vacant WBO youth Intercontinental super bantamweight title. In the main event Donnie Nietes successfully defended his WBO title via UD against Juan Alejo in a bloody fight. Judges scores 120-108, 119-109 and 119-109.